"Drip-irrigated lemon #orchards on the eastern edge of San Bernardino County, in #California. The company Cadiz owns 34,000 acres in the Mojave Desert, with billions of gallons of fresh water locked deep below the sagebrush-dotted land. But it will take at least another $200 million for Cadiz to dig dozens of wells, filter the water and then move it 43 miles across the desert through a new pipeline before thirsty Southern Californians can drink a drop. 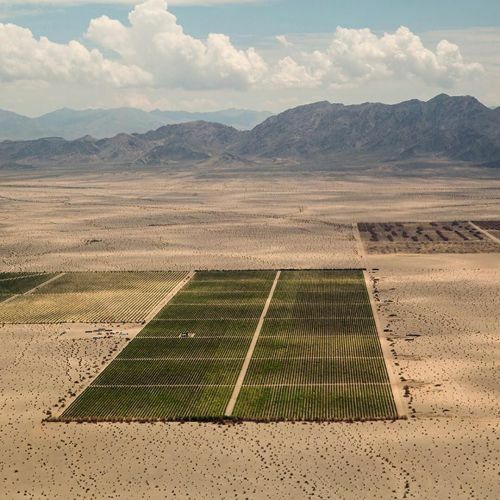 Over the last decade, revenue from the lemon groves and vineyards owned by Cadiz in the #Mojave have added up to only a trickle: $7.1 million total since 2005. @malmeidapix took this #aerial photo from a small plane over the #Mojave in the summer." By nytimes on Instagram.